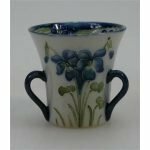 Moorcroft Pottery Valuations & Appraisals – Jug Figurine Vase Bowl Plates Dish Mug Dinner Service Saucer Pot Tankard Teapot Tea Service Cup Tea Set Coffee Service Jardinière Sugar Bowl Plaque Tureen Candlestick Charger Pitcher Platter Urn. 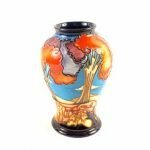 A Moorcroft Wanderers Sky pattern vase, designed by Emma Bosons, with impressed and painted marks to base. 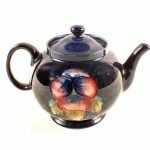 A Moorcroft Pansy pattern teapot on blue ground, with marks to base. 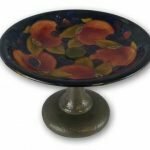 A William Moorcroft for Liberty and Co comport, tube lined in the “Pomegranate” pattern with Tudric hammered pewter base. 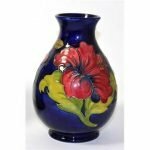 Walter Moorcroft vase in the Hibiscus pattern with impressed and painted marks. 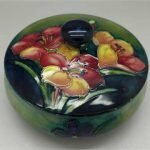 A William Moorcroft freesia pattern lidded pot, signed on base and paper labels to base and inner lid. A William Moorcroft vase in Pansy design on green ground, stamped to base Moorcroft Burslem, with script William Moorcroft signature in green. 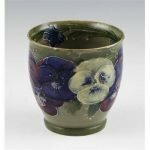 William Moorcroft MacIntyre Miniature tyg vase decorated with violets C1908 & signed to base. 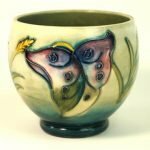 A Walter Moorcroft pottery vase of squat circular form Decorated in the ‘Lily’ pattern on a light green ground, impressed factory marks to base. 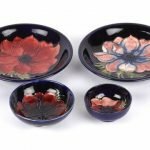 A pair of William Moorcroft Anemone pattern tube lined dishes, 20th century, of circular dished form with dark blue ground and central flower head, together with two small bowls in Anemone patterns, impressed and painted marks to bases. 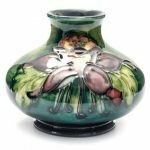 A Moorcroft Orchid squat baluster vase, the green ground tube line painted, blue marks to base. 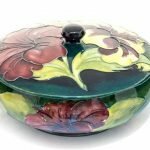 A Moorcroft Hibiscus pattern bowl and cover, squat form, green ground, impressed marks and late Queen Mary sticker to the lid. 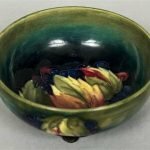 A William Moorcroft pottery bowl Decorated with the Leaf and Berries pattern, signed and impressed marks to base.